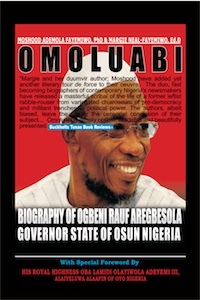 Omoluabi: The Biography of Ogbeni Rauf Aregbesola Gov State of Osun Nigeria With Special Foreword by His Royal Highness, Oba Lamidi Olayiwola Adeyemi III, Alaiyeluwa Alaafin of Oyo Nigeria By Moshood Ademola Fayemiwo, PhD & Margie Neal-Fayemiwo, Ed.D. This book is about Ogbeni Rauf Aregbesola, the political cat with the proverbial nine lives. This is Ogbeni’s story, the people’s governor and the bête noire of the PDP in Osun state. This is his biography. Who is Ogbeni Rauf Adesoji Aregbesola? Where did he grow up and who were those that shaped his formative years and which political forces burnished his years of activism as a young man? How did he systematically turn the state of Osun around in eight years to the envy of his political traducers and critics? How will history judge the first democratically-elected chief executive of Osun state to govern the Land of Virtues for eight action-packed years in quarter of a century? This is the first detailed biography of Ogbeni Rauf Adesoji Aregbesola written by two US-based biographers/authors. It is titled: “Omoluabi” which in Yoruba literally means: "A Paragon of Virtues" which adequately captures the persona and quintessential ideology of Ogbeni Aregbesola. This is the authoritative biography of Ogbeni Rauf Adesoji Aregbesola, the Governor of the state of Osun (2010-2018) Federal Republic of Nigeria. Osun state under Gov. Aregbesola is on a steady growth. I so much appreciate the good road networks; the state is investing in infrastructure and it is very good for the future and overall development of the state. A review of the administration of Ogbeni Rauf Aregbesola would reveal no diminution of resolve and commitment to better the lot of the masses and underprivileged, even in the face of dwindling financial resources. Who is Satan or Devil? How does his kingdom operate? The Holy Bible contains spiritual secrets Christian Sisters can tap into in 12 months; from month of Nisan to Adar to find their husbands. In this book, find out those secrets and testimonies of Christian Sisters who have used these Holy Spirit-inspired secrets to settle down to their God-given husbands. Moshood Ademola Fayemiwo and Margie Neal-Fayemiwo are authors, writers and biographers of seven published books and both run The Jesus Christ Solution Center-a non-denominational Christian Retreat Center -based in Cameron near Austin, TX USA.